Wood is a natural product and as such knots, grain and small movements within our furniture are completely normal, adding to the individuality of each piece. 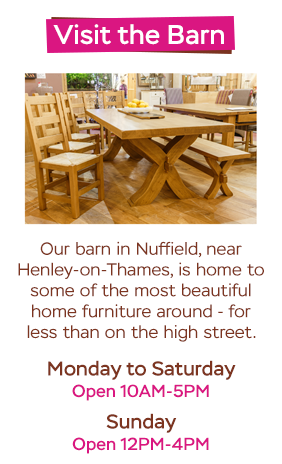 All our wood furniture has been finished with either a lacquer or a wax to protect the wood whilst keeping its natural appearance. All furniture with a lacquered finish can be kept looking at its best simply by polishing regularly with a clean damp cloth. Over time, waxed furniture will fade and may become dry. This is completely normal and not a defect. It can be brought back to life by using furniture bees wax roughly once a year. Apply the wax to the furniture according to the manufacturer's instructions using a clean cloth. Periodic maintenance is essential in keeping your waxed furniture looking at its best. Please note that applying any wax will naturally change the finish of your product and that the right colour selection is very important. Cleaning materials such as furniture polish should not be used on furniture with a waxed finish. Our New Trend Concepts leather sofas are made by hand in Italy and use 100% real leather. If you wish to enrich the finish on your leather sofa it is advisable to apply a Balsam care product sparingly and no more than twice a year. We recommend that to keep your leather sofa in good condition that you dust down the leather with a barely damp cloth regularly, as well as vacuuming the seat platforms to remove crumbs etc. and wiping up any spillages immediately. Prolonged sunlight or heat may cause some colour movement over time, and should therefore be avoided. Please be aware that any hot items or moisture that come into direct contact with your furniture can cause discolouration. Wherever possible, do not position any of your furniture in direct sunlight or next to a direct heat source. We advise against permanently covering any wood furniture (eg. dining tables) with plastic cloths or glass as this may cause cracks to form in the wood. We do, however, recommend the use of placemats and coasters on dining tables to prevent any heat marks to form on the wood. Additionally, we advise any spillages on wood tabletops to be cleaned immediately as some spillages can stain different types of wood. Dining tables should be left extended for the first few months of use to avoid uneven shading. Any objects on the surface of a dining table need to be moved regularly to avoid shading. Never leave spillages on your furniture. Remove them immediately with a blotting action. For protection against heat, quality tablemats and cloths should always be used. Take care that no area of a plate or dish base overhangs a tablemat or placemat. When writing, a protective mat should be used to protect the surface from marking. Furniture will endure most temperatures in the modern home. However, it should be positioned as far away as possible from direct heat sources or direct sunlight. It is always advisable to level furniture when placing it. This will ensure wardrobe doors are level and removes undue pressures on joints. Never drag furniture - always lift it.